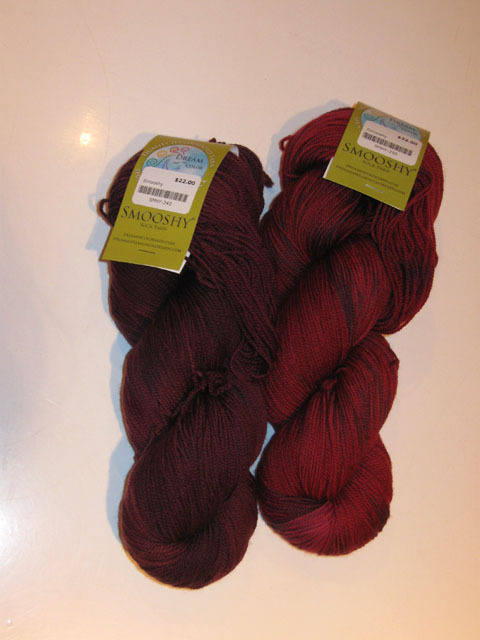 « Webs Detour – We stop for yarn! 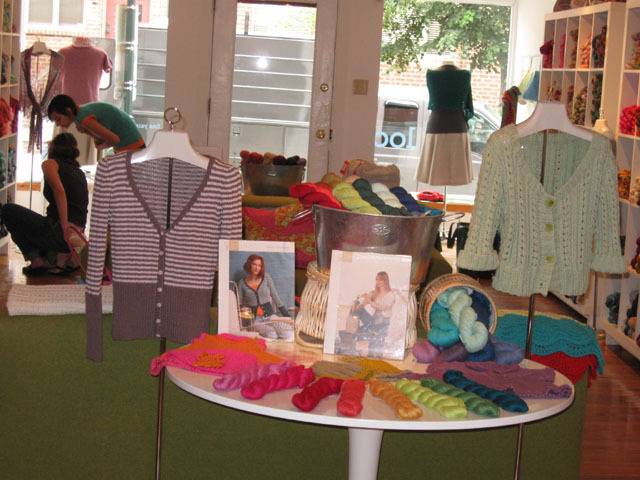 My friend Amanda and I use our speaking engagements as an excuse for knitting and scouting out new shops. Our talks at the TS2 in Philadelphia was no exception! You must understand that the journey itself is an excuse to get knitting done in planes, trains, and automobiles. Before leaving, it helps to plan your knitting so that you have travel friendly supplies that pass TSA scrutiny and an extra project in case you get stumped or bored. I always use circular needles in bamboo or plastic for plane travel. Since I was meeting Amanda by way of Omaha, I had started work on the Saffron Tunic, a pattern from Jean Moss’s Sculptured Knits. As written, the pattern is for a girl but the measurements could easily be adapted to fit me. Since the pattern called for another type of Jaeger cotton, I thought that it would be a perfect project for the Jaeger Sienna that I bought at Webs. 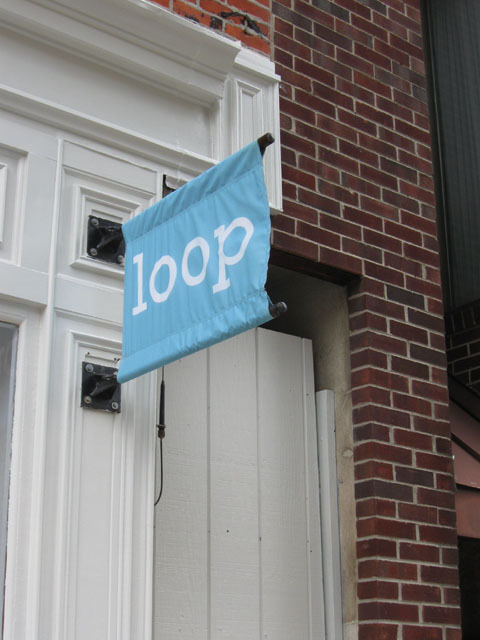 I had researched Philadelphia yarns stores online. 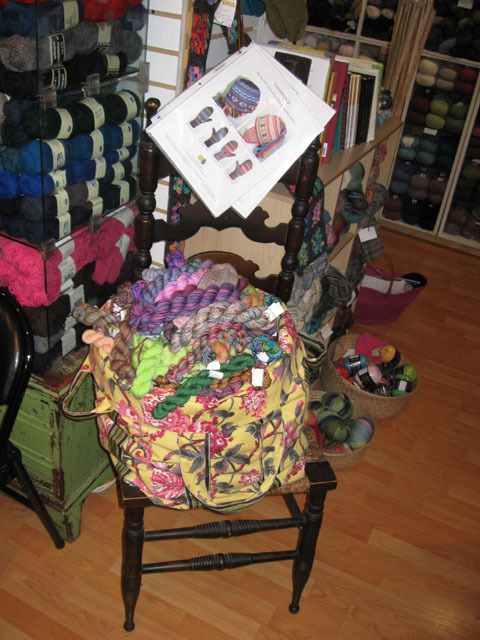 I was enticed by the book offering and the Wednesday knitting circle at Rosie’s Yarn Cellar off of Rittenhouse Square. 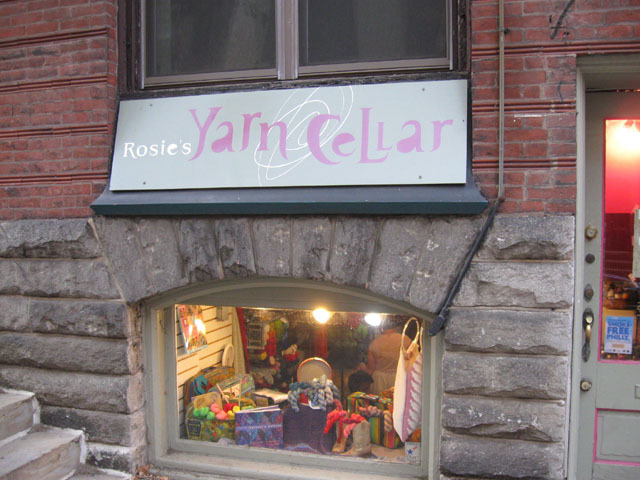 The store beckons from its slightly below street level entrance way. The display of Koigu in the main room was enticing but I was lured into their backroom which was filled with books. It was my first exposure to such a selection of Japanese knitting books. I found Heirloom Knitting, a book that I wanted. It’s subtitled A Shetland Lace Knitter’s Pattern and Workbook. Amanda and I took out our knitting to join the growing circle but I must admit that there was a chill in the air despite being the end of July. One of the members was knitting a scarf out of cat hair (I kid you not!) for a neighbor. The collective opinion was that memories of the cat had to be better than the yarn! 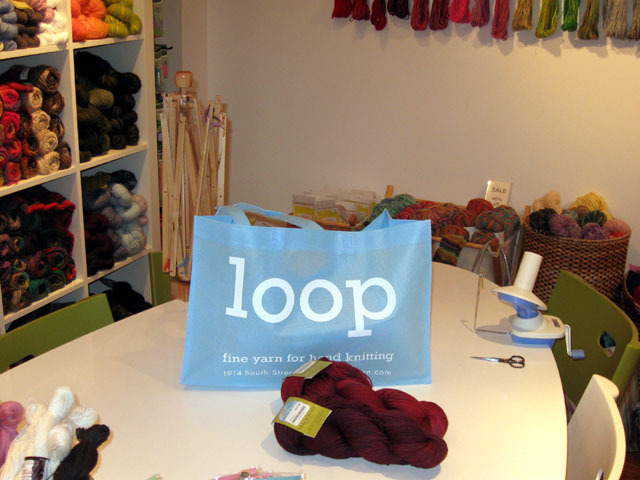 After our talk on Thursday, we packed our bags and grabbed a taxi to Loop Yarns, where the staff was much friendlier. 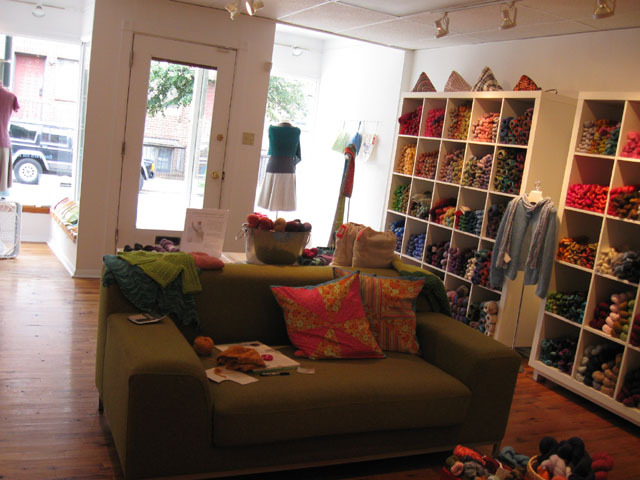 The yarn in Loop is attractively displayed and there are a set of couches in addition to the work table. 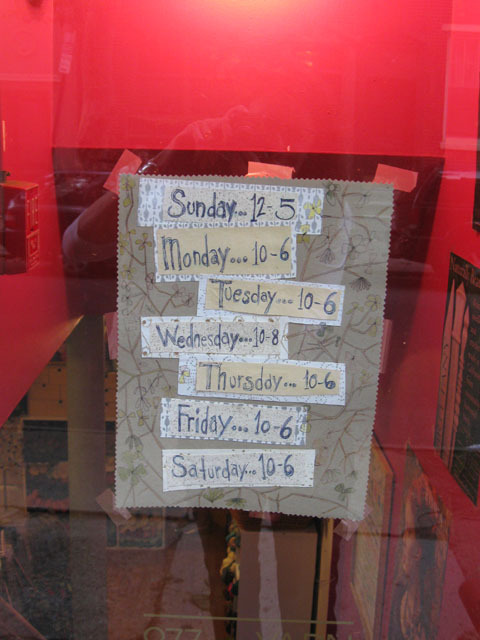 Like Purl Soho, it has a sister store focused on quilting next door. Although I was enticed by the Smooshy name, I bought two skeins of Koigu in pinks and purples to make a Lace Ribbon Scarf. Despite the rush hour crowd, we managed to add some more knitting time on the Amtrack train north.